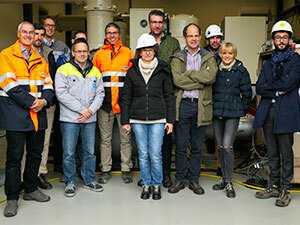 A group of environmentally-minded utilities from across Europe gathered recently at the Etzel substation near Zurich, Switzerland, to witness a world first in the transmission and distribution industry: the successful high voltage (HV) testing of the first SF6-free 110 kV Gas-Insulated Substation (GIS) using Green Gas for Grid (g3, pronounced "g" cubed). Utilities present were: Axpo, EKZ and Romande Energie (Switzerland), TenneT (Netherlands), Rte (France). g3 is GE's environmentally friendly alternative to sulfur hexafluoride (SF6), commonly used as insulation medium in High Voltage switchgear. Ordered by Axpo Power AG and the Elektrizitätswerke des Kantons Zurich (EKZ), the groundbreaking substation is the first full 110 kV installation to use g3 instead of SF6. This makes all the difference for the planet. The g3 GIS will run just like an SF6-insulated GIS, achieving the same performance, with the same size, under the same ambient conditions (down to -25°C), but with a global warming impact from the gas that is less than 1% when compared to an SF6 GIS. The low gas emission rate over the life cycle, together with the low global warming potential, will prevent 700 tons of CO2 equivalent from entering the atmosphere. In addition, it will help the utilities reach their sustainability targets. For example, Axpo's targets included lowering their greenhouse gases emissions in Switzerland by 80% between 2008 and 2017. To put this in perspective, SF6 is a greenhouse gas with a global warming potential (GWP) up to 23,500 times greater than carbon dioxide (CO2), and it can remain in the atmosphere for 3,200 years. 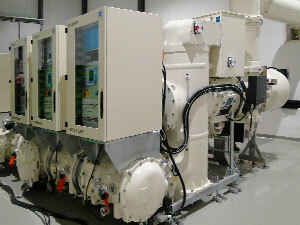 To date, there had been no alternative to SF6-technology in High-Voltage Switchgear. However, electrical transmission grids need to transmit more power with less environmental, financial and operational impact, and face pressure to demonstrate stronger social responsibility. g3 was first implemented in April 2017 at National Grid's Sellindge Substation as the first SF6-free 420 kV gas-insulated line (GIL). Six (6) others sites will be equipped with g3 GIS or GIL in 2018-19. g3 solutions are fully type-tested and commercially available for GIS up to 145 kV, GIL up to 420kV, and AIS current transformers up to 245 kV.